February is Black History Month and New York State offers a special window into African American history and American culture as it was a center for 19th century anti-slavery organizations, and home to Frederick Douglass, Harriet Tubman and many other Abolitionist and Underground Railroad leaders. In the 20th century the National Association of Colored People (NAACP) has its roots in the Niagara Movement, whose first meeting in 1905 took place on the Canadian side of Niagara Falls because members were turned away from hotels on the U.S. side. Today, thought-provoking historic sites, museums and events help visitors understand the roles and lives of enslaved Africans, the struggle for freedom and equality, and the many contributions of African Americans. There are more than 24 Underground Railroad sites throughout the state and former slaves’ quarters can be viewed at many well-preserved 17th and 18th century homes and estates. Most people are surprised to know that New York was a slave state until 1827, and at one time, nearly half of all households included at least one enslaved African. February’s Black History Month is a great time to explore this rich cultural legacy throughout New York State, but be sure to include these fascinating sites in your travels as you explore the state year-round. The new, recently introduced by , makes it even easier to explore Black heritage sites. Civil Rights, a key aspect of African American culture, are one of 12 themes used to organize 200-plus heritage sites across the state under the state’s “Path Through History” program. The program includes identifying markers on major state highways as well as additional local signage with a distinctive Path Through History logo to help point the way. A webpage provides a list of sites along with information about each one. Path Through History will be celebrated with more than 200 events throughout the state on June 1 -2 and 7 – 8, so check back for more information. You may know the song. “John Brown’s body lies a-mouldering in the grave,” begins the famous song about militant 19th-century abolitionist John Brown. Best known for his failed raid on Harper’s Ferry arsenal in Virginia which was meant to be a prelude to liberating the slaves in the South, Brown was also a “conductor” on the Underground Railroad, fought the spread of slavery to Kansas and helped black families develop their own farms in New York. Visitors to the John Brown Farm State Historic Site, just outside Lake Placid, can see his simple farmhouse and gravesite. Guided tours of the house are only available between May and October, but the grounds are open year-round. Fighting in the American Revolution. During the Revolutionary War, about five percent of the Continental Army was African American and the army was racially integrated, something that didn’t happen again for nearly two centuries. During Black History Month, Saratoga National Historical Park will present an exhibit recognizing the role of black soldiers at Saratoga. The displays will include memorabilia and photos of Agrippa Hull, an African American soldier who went on to become a highly successful businessman. Center for Abolitionists. By the 1830s, there were an estimated 20 abolitionist groups in Oneida County. In 1835, about 600 abolitionists gathered in the Bleecker Street Baptist Church in Utica. When the meeting was broken up by a mob, wealthy landowner Gerrit Smith invited the group to reconvene near his home in Peterboro, about 30 miles away, and the inaugural meeting of the NYS Anti-Slavery Society was then held in the Peterboro Presbyterian Church. The former church, now the Smithfield Community Center in Peterboro, houses the National Abolition Hall of Fame and Museum– its exhibit hall is open to visitors from May to September. Following that meeting, Smith became one of the antislavery and civil rights movements’ strongest advocates, helping hundreds of African Americans by purchasing their freedom, and providing safe haven, land, and employment. Smith also inspired and supported many abolitionists, helping to make Peterboro an important part of the Underground Railroad. The grounds of the Landmark, including a 22-panel outdoor exhibit, are open year-round for self-guided tours from dawn to dusk daily, although buildings are only open from May to September. Disguised as Women. 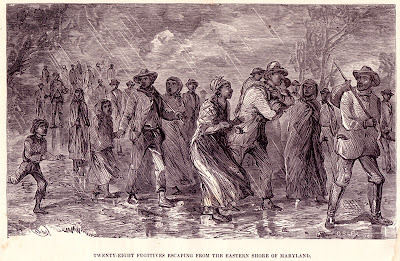 Many slaves on the run from bounty hunters were ushered through Chautauqua County by the Underground Railroad. An exhibit at the Fenton in Jamestown uses artifacts and a movie to illustrate the important role Jamestown and Chautauqua County residents played in the Underground Railroad, including the story of escaped slaves disguised as women who were captured by bounty hunters. The exhibit has been closed for renovations but is slated to reopen in February- be sure to call (718-664-6256) to confirm it is open. The Underground Railroad Stopped Here. The Underground Railroad, quite active in the Finger Lakes, is the subject of “Freedom Bound: Syracuse and the Underground Railroad,” an exhibit at the Onondaga Historical Association Museum&amp- Research Center in Syracuse. Visitors to the region can also head to Auburn to see the Harriet Tubman Home, house of the famed Underground Railroad “conductor,” Civil War spy and promoter of black and women’s rights, as well as the Seward House where her supporter, U.S. Senator William H. Seward, lived and sheltered fugitive slaves. And in Ithaca, the congregation of the St. James AME Zion Church, which is still in service today, not only helped send fugitives on to Canada, but also helped many to establish their homes in the community. 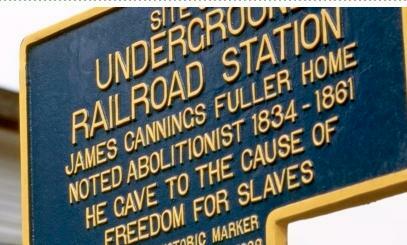 as a major voice for abolition and a leading “conductor” on Rochester’s Underground Railroad. At the “Flight to Freedom” exhibit in the Rochester Museum &amp- Science Center, interactive exhibits reveal his story along with those of freedom seeking former enslaved Africans including Austin Steward, Harriet Jacobs and Reverend Thomas James. Younger children will especially relate to the story of little Imani, as she escapes north with her family. It makes you think. Other key Civil Rights sites in the Finger Lakes include the 1816 Farmington Quaker Meetinghouse, a center for equal rights, and the Matilda Joslyn Gage House in Fayetteville, a museum devoted to furthering the progressive ideas of suffrage leader and abolitionist Matilda Joslyn Gage. The Birth of the NAACP. A meeting in the Buffalo home of Mary Talbert set in motion the Niagara Movement, forerunner of the National Association for the Advancement of Colored People (NAACP). The church she attended, the Michigan Baptist Church is now on the National Register of Historic Places, and Nash House, home of its influential pastor and African-American leader, is now a museum. Last Stop on the Underground Railroad. Buffalo was also a key link in the Underground Railroad, and the last stop on the way to Canada. Motherland Connextions offers lively tours led by “conductors” in period dress that visit many of the city’s Underground Railroad sites, and Freedom Crossing is a film exhibit about the Underground Railroad in the Buffalo-Niagara region. A Creative Center. Buffalo, long a center for ideas, offers many ways to celebrate black culture. In the lively Michigan Street Heritage Corridor neighborhood, enjoy the vibe at the Colored Musicians Club, one of the oldest operating African American jazz clubs in the world, where Ella Fitzgerald, Dizzy Gillespie and other jazz greats have performed, or attend a dance or theatrical performance at the African American Cultural Center or the Ujima Company. Slavery and Emancipation. While the Hudson Valley had active abolitionists, and later participated in the Underground Railroad, the region’s farms once used the labor of enslaved Africans. John Jay, one of the early advocates of emancipation and a founding father of the United States, pushed for the abolition of slavery in New York State despite the fact that he himself was a slave owner. Jay’s estate, now the Jay Heritage Center in Rye, hosts programs in history, social justice and environmental stewardship. The Carriage House and Grounds are open to the public- however tours of the Manor House must be reserved in advance. Where the slaves lived. For a fascinating glimpse of slave life, visit Philipsburg in Tarrytown, an 18th-century working farm where costumed interpreters, such as Caesar, the enslaved African miller, and Dimond, an enslaved riverboat pilot, bring to life the reality of slavery in the north. A lasting haven. In nearby Tarrytown, the Foster Memorial AME Zion Church, founded in 1860, provided food and shelter to fugitive slaves on their way to Canada, many of whom settled in Tarrytown. The church is still a focal point for the black community. Slavery and Freedom. About 90 minutes north, the Hurley Heritage Society offers a self-guided walking tour of the Houses, many of which relisted on the National Register of Historic Places. These well preserved homes, most dating to the mid 18th century and still occupied, include Hardenbergh House, where famous abolitionist and woman’s rights orator Sojourner Truth lived in slavery for about six years, as well as a home with slave quarters and another house that was part of the Underground Railroad. Discover African-American culture. The African-American Museum in Hempstead focuses on the history of African-Americans on Long Island and black contributions to American culture. There are always arts and crafts workshops as well as art installations and historical exhibitions. The museum also frequently presents film programs, community service events, and educational programming in addition to workshops in genealogical research. A talent for poetry. Joseph Lloyd Manor House in Lloyd Harbor is where Jupiter Hammon, a talented and privileged enslaved African, lived and wrote. Educated by the family that he lived with, he became the first published black poet in the U.S.
Hands-on History. King Manor in Jamaica, Queens, is a museum dedicated to preserve the historic home and legacy of Rufus King. Black history month is a fitting time to recall this outspoken opponent of slavery. Born in 1755, was a member of the Continental Congress, a framer and signer of the Constitution, one of the first Senators from New York State, the ambassador to Great Britain under four presidents, and even ran for president himself in 1816. In 1820, he delivered two of the most radical and eloquent anti-slavery speeches heard in the Senate before the Civil War. His opposition to the admission of Missouri as a slave state marked the height of his long antislavery career. His eldest son, Governor John Alsop King, also worked to restrict slavery’s expansion. For families, a great time to visit is Feb. 9, from noon to 3, when Hands-on History will feature crafts and stories about the King children. Pictures of Black Culture. The Studio Museum in Harlem draws together works influenced by black culture and works by artists of African descent from around the world. Located in the heart of Harlem on 125th St., the museum has both permanent and changing exhibitions. The Schomburg Center for Research in Black Culture, part of the New York Public Library system, offers cultural programs and exhibitions throughout the year. Among current programs, Visualizing Emancipation, on display until March 12, is commemorating the 150th Anniversary of the Emancipation Proclamation with pre- and post-Civil War era photographs of enslaved and free black women, men and children, including black soldiers and workers in the American South. Here’s the link to the site for Philipsburg Manor, which is mentioned above. Thanks. I’ll be sharing this and trying to visit these places I did not know about. Interesting. A good summer trip to all the various places seems like a dream. The Schomburg and the Studio Musuem are good to visit throughout the year. Urban Community students at CNR have found this data to be especially useful for site visits, field trips, and additional information regarding Black History and Culture. Thanks for the uplinks!